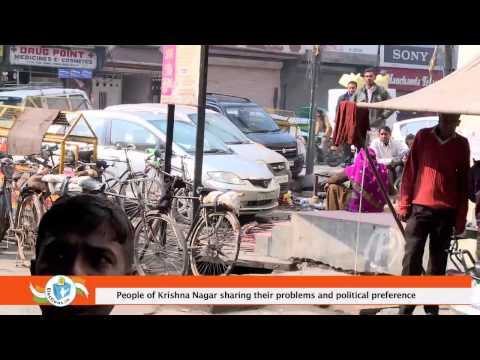 Krishna Nagar is an urban constituency located in the East Delhi district of Delhi. It belongs to East Delhi parliamentary constituency. The issues of inflation and corruption dominated the 2013 Delhi Assembly elections in the constituency. The constituency has been a BJP bastion. Dr Harsh Vardhan of BJP has represented it since 1993. 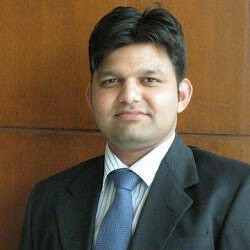 He defeated Dr Vinod Kumar Monga of INC with a huge margin in the 2013 Assembly elections by securing 69,222 votes as against Monga's 26,072. The Assembly seat of Krishna Nagar stands vacant at the moment as the last winning MLA Dr Harsh Vardhan was elected to the Lok Sabha in the 2014 Indian General Elections and became a Union Minister. The seat could not be occupied as President's Rule was imposed in Delhi. Former IPS officer Kiran Bedi is the BJP’s candidate from Krishna Nagar in the 2015 Delhi Assembly elections. 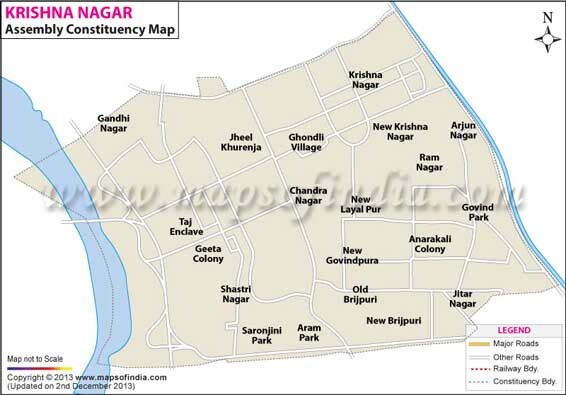 Map showing the different localities of the Krishna Nagar Assembly Constituency. Below is the list of winners and runners-up in the Krishna Nagar assembly elections conducted so far. Radhey Shyam Park Extn. 1 - Block B, Radhey Shyam Park Extn1 - Block A, Radhey Shyam Park Extn.